"I’m telling you this not because it’s related to knitting, but because it’s central to understanding who Icelanders are." I'm someone who's been interested in Iceland for awhile. I fell in love with Iceland through music first, listening to a lot of Sigur Rós and Múm when I was in high school (Múm's Finally We Are No One is still my desert island record after a decade and a half of listening to it). Later in college, when I started knitting more than just scarves, I began to get interested in Iceland's knitting as well (the 2007 Sigur Rós film Heima helped - it documents a series of free outdoor concerts they gave in Iceland and it feels like every third person in the film is wearing a lopapeysa). 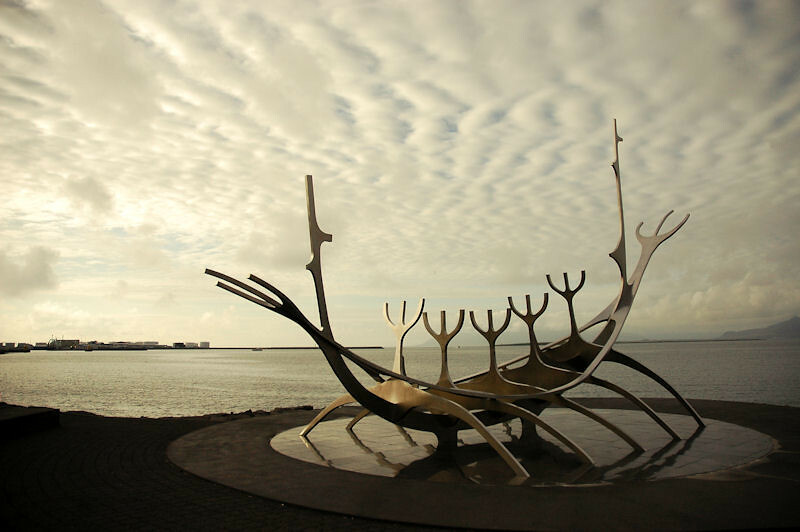 I'm lucky to have been to Iceland several times now and I've done a lot of reading about Iceland's history, its language (which I've studied), and its literary tradition. I completely agree with Jess that this kind of knowledge lends a much deeper understanding of why the Icelandic sheep are the way they are, why the wool is so practical and useful and holds a place of such importance, and how much more beautiful its place in society is because of all of that. Following that line of thought: I recently read a book that increased my depth of knowledge about Iceland in a very different way. This is not a book about knitting. But this book taught me so much more about Iceland's history and Iceland's spirit than I knew before I read it. Jess's post features a quote from Árni Árnason on the lopapeysa: "It resembles the country’s rugged nature and reminds us of the history of farming and fishing when it provided its wearer with a vital shield from the disastrous weather one can encounter in the wild." Farming and fishing. Sheep, of course, are a vital part of Iceland's farming history, but I'd never spent much time thinking about Iceland's fishing industry beyond harðfiskur or fish leather, particularly given the challenges presented by the harsh climate. So I was very intrigued when I came across Seawomen of Iceland by Margaret Willson, a cultural anthropologist at the University of Washington who once worked on fishing boats herself (hat tip to Seattle's Nordic Heritage Museum, which is how I found out about the book). I appreciate this book so much for the glimpse it provides into the history of women in Iceland's fishing industry (which it seems is often overlooked even by Icelanders themselves), but also for its recognition of how dramatically Iceland's industry and cultural landscape has changed in the previous decades. The mass migration of people from the rural countryside to the city is staggering to think about when considering the ripple effect on the towns that get left behind. So while it's not a book about knitting, those of you interested in Iceland might find something to interest you here. It's available on Amazon or directly from the UW Press. Thanks to Jess for such a wonderful post today over on Fringe and thank you to Margaret for such an incredible work of research.